Many movable parts of your vehicle's undercarriage are serviceable, including ball joints, steering components, driveshafts, etc. Why wouldn't you want your vehicle's suspension points to be serviceable as well? 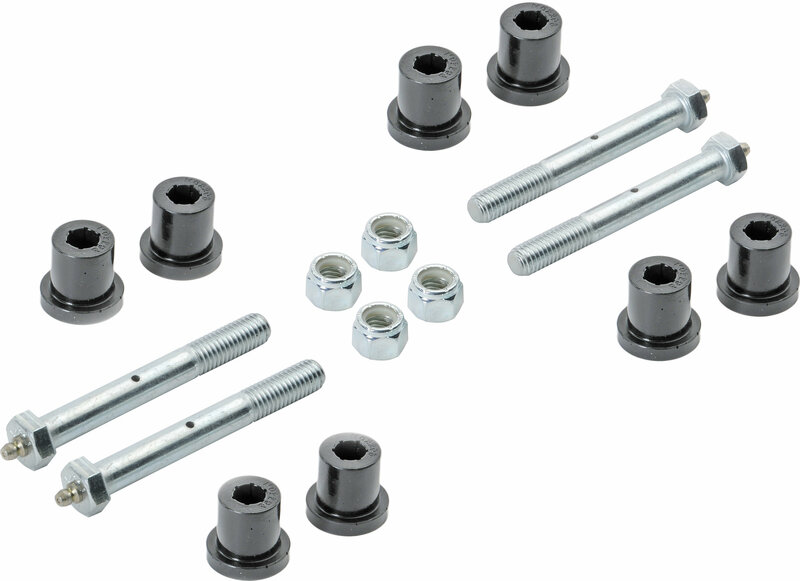 Daystar's Greasable Bolt & Bushing Kits allow you to do just that. these kits contain bushings with flutes that allow grease to flow across the entire bushing surface, eliminating squeaks and wear. This grease is delivered via rifle-drilled bolts with an easy-to-access grease zerk on the end and a sleeve with a grease hole in the center. These kits include the specified bushings, bolts, and sleeves in one convenient package. Combine our Greasable Bolt & Bushing Kits with our Lubrathane, a unique blend of grease that resists contamination and will not degrade Polyurethane bushings. Good kit, easy install once old ones are gone. Just put them on, but will have to wait and see how they hold up.